Surprising they were very easy to make, the inspiration shoes are $49.99 at Spring and my DIY cost me $1.99! What you need: old black heels, lace material, hot glue gun,scissors. I started at the back and started gluing the material to the edge of the shoe. I did this all around the whole shoe. Start at the back again and start to pull the material up tight and glue it all around the top. Once the top is all glued you will have excess material hanging over the inside of the shoe. 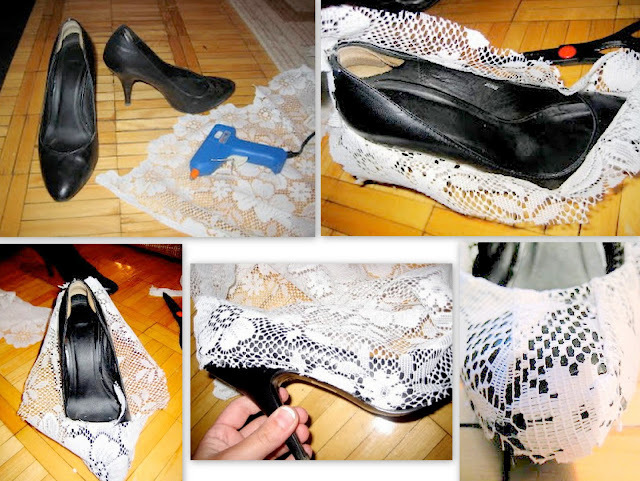 Pull the material again and glue it down inside the heel. Lastly take your scissors and trim up any uneven pieces.